Do the trees in your yard need some TLC? 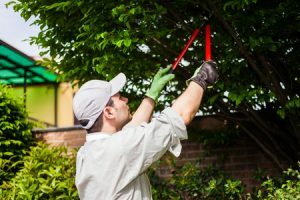 It’s typically a good idea to do most of your heavy pruning just prior to winter, but you can do some light pruning in the summer to keep your trees looking their best as well. This time of year, you just need to be careful about when you prune and how much you prune. Check out a few summer pruning tips below! Start pruning as early in the summer as you can. If you’re going to prune your trees in the summertime, it’s best to do it at the beginning of the season. This will give the trees plenty of time to bounce back and grow while it’s still warm outside. If you wait too long and don’t prune them until the end of the season, it can contribute to unnecessary stress on the tree later in the year. Try not to prune right after it rains. You should generally prune trees on dry days, because pruning after a rainstorm can expose the tree to more pathogens that cause disease. If possible, wait for a nice stretch of clear weather to do your pruning this summer. Avoid exposing wood to too much sunlight. Excessive pruning can leave a tree’s trunk and scaffold branches exposed to harsh sunlight in the summer. Too much sunlight can scald the trees and cause the exposed wood to decay. Be sure to leave enough branches in the canopy to shade the trunk, and treat exposed sections of the trunk with whitewash to prevent sun damage. Need a hand taking care of your trees this summer? The team at Brother Tree & Lawn would be happy to help. Give us a call or contact us online to schedule an appointment today!